Nero Claudius Caesar Augustus Germanicus succeeded his great-uncle and adoptive father Claudius as ruler of Rome in AD 54 when he was only seventeen years old. He held the throne for fourteen years until he was overthrown in AD 68 and forced to commit suicide by supporters of Galba, who succeeded him. The death of Nero brought Rome’s first imperial dynasty, the Julio-Claudian dynasty, to an end. was on a larger scale than that of any reign since Augustus, though still only two-thirds that of Rome’s first emperor in terms of active mints. Cities in Western Asia Minor are especially well represented, and Antioch in Syria made an exceptionally large output of silver tetradrachms. Alexandria also produced its debased tetradrachms on an unprecedented scale. All the previous emperors, except Caligula, were commemorated by Nero on his Greek Imperial coinage, as were his mother, Agrippina, and his wives Octavia, Poppaea and Statilia Messalina. The famous cult statue of Apollo Didymaeus featured on this coin’s reverse was housed in the temple of Apollo at Didyma, an ancient shrine and oracle in Milesian territory a few miles south of the city. The statue was also represented on the autonomous Milesian bronze coinage of the first and second centuries BC. Didyma continued to be an important place of pilgrimage throughout the Roman period. This is the only recorded denomination for this type, and the named magistrate, Tiberius Claudius Damas, is the only magistrate known to be associated with Nero’s Milesian coinage. His name also appears on archaeological inscriptions which identify him as archiprytanis and which give “details of legislation passed about the cults of Apollo Didymeus and Apollo Delphinios” (Burnett et al., 1992–1999; not seen); he cast himself as a renewer of traditional customs within the community (Goldhill, 2001: 7–8). RJO 84. Bronze 21 × 19 mm (5.70 g, ↑←), AD 54–68. Obverse: laureate head of Nero right; expected inscription ϹΕΒΑϹΤΟϹ off the flan. Reverse: statue of Apollo Didymaeus right, holding stag and bow; ΕΠΙ Τ[Ι ΔΑΜΑ] reading downward to left; ΜΙΛΗϹΙΩΝ reading upward to right. Compare Sear (1982: #569); Burnett et al. (1992–1999: #2713, not seen); SNG Von Aulock (#2104, not seen). had her own Archaic altar in the Delphinion [in Miletus proper] (Milet 1.3.276 #131), probably with the matching epithet Delphinia, while at Didyma Artemis was the second most venerated deity, usually worshipped under the epithet Pythia. She had an archaic temenos at Didyma from the seventh century, complete with an altar, rock basin, and spring, and a dedication from the sixth century near the northwest corner of the Temple of Apollo reads: “to [Arte]mis [– and Ap]ollo.” In addition, Artemis had her own temenoi: a probable sanctuary stood by the southern cross wall at Miletos; and as Kithone (Goddess of the Tunic), she had a short-lived fifth-century temple on the East Terrace of Kalabaktepe that is referred to by Kallimachos in his Hymn to Artemis (3.225-27). Specimens of this type are known with Nero to left ( SNG Copenhagen , 1982: #1010–1011) and also with Nero to right ( SNG Copenhagen , 1982: #1012). This is the only denomination recorded for this Nero/Artemis type. RJO 102. Bronze 21 × 19 mm (6.67 g, ↑↑), AD 54–68. 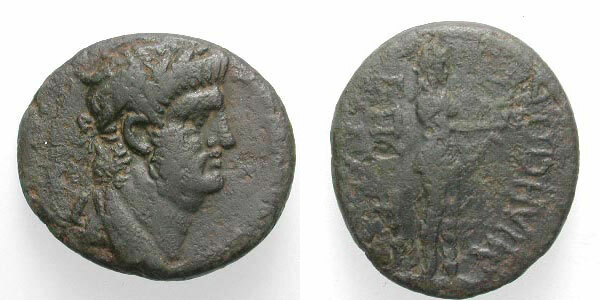 Obverse: laureate head of Nero right; expected inscription ϹΕΒΑϹΤΟϹ off the flan. Reverse: statue of Artemis standing, holding patera and bow; stag behind to right; inscription [Ε]ΠΙ ΤΙ ΔΑΜΑ vertically downward to left; dotted border. Compare SNG Copenhagen (1982: #1012); also Burnett et al. (1992–1999: #2715, not seen); BMC #150 (not seen).